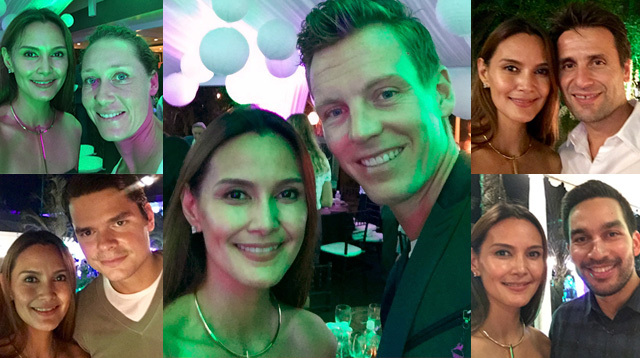 Can These Tennis Stars Handle Tweetie De Leon-Gonzalez's Quickfire Questions? A tennis nerd challenges 5 tennis stars to a 5-set speed game of get-to-know. I'm a tennis fanatic and nerd who has never played the sport, but I braved horrific Saturday traffic (a would’ve-been two-and-half-hour trek which extended to three due to a worst-timed car collision) for an exclusive tennis charity dinner in Makati. The traffic experience, much like a tense tennis rally, was a true test of patience wherein you resist all urges of cracking under pressure and committing that dreadful error. Eye on the prize, baby, always. In this instance, the prize was a special meet and greet with some of the world’s best tennis masters this generation has seen. Serena Williams, Tomas Berdych, Ana Ivanovic, Milos Raonic, Richard Gasquet, and many others (Rafael Nadal was due to arrive in Manila a few hours after the dinner reception) are in town for the second leg of the International Premiere Tennis League (IPTL), a novel tournament concept by Mahesh Bhuphati whose intent is to bring world class tennis matches to the East. It caps the 2015 tournament season with a fun format involving teams instead of individual players and some such fancy score-enhancing options like the power point in which a winner of a play gets a double score. The Legendary Japan Warriors join our Singapore Slammers, Mircromax Indian Aces, Philippine Mavericks, and OBI UAE Royals this year, completing a very compeitive lineup. I arrived unscathed but somewhat shaken as I usually am during Grand Slam season, and weary like I played an extended tiebreaker with American pro tennis player John Isner. Surely, nothing a few friendly faces, a knockout dinner, and a glass of wine couldn’t fix. Finding that the special guests, too, have settled in quite nicely, and taking a cue from the IPTL’s bullet-paced format, I wasted no time serving five rapid-fire icebreakers. I asked five tennis players. The one element in IPTL that changed your game entirely: Every game counts so there is a lot of pressure on the court. You want to win as many games as possible so you need to always stay focused. The one thing you miss most about home when on tour: Home, just home. That is where my family is. Whether on tennis grounds or on a hot seat, these affable, marvelous athletes will ace any game you hand and steadily hold court. The nerd in me concedes.